Paid weekly at $59.94 for 3 meals for 2 people. 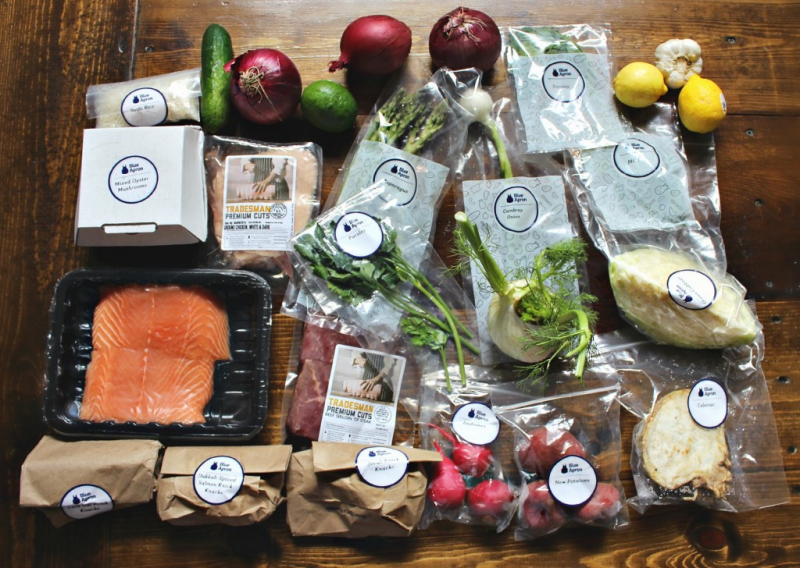 Blue Apron started in the summer of 2012 and quickly has become one of the premier meal kit delivery services nationwide. Every month they deliver more than 3 million meals across the United States. Blue Apron ensures with the ingredients they provide for their meals, that they are of the highest quality and from farmers who practise responsible farming and ranching. Regenerative practises of the food suppliers are important to Blue Apron. They want the best quality produce from farmers who minimize the use of fertilizers, pesticides and carbon emissions. So why is this service called Blue Apron? When chefs are learning to cook they wear blue aprons. This is a tradition that is followed around the world and the people at Blue Apron hope to inspire their community in a lifelong journey of learning to cook (and love doing it). 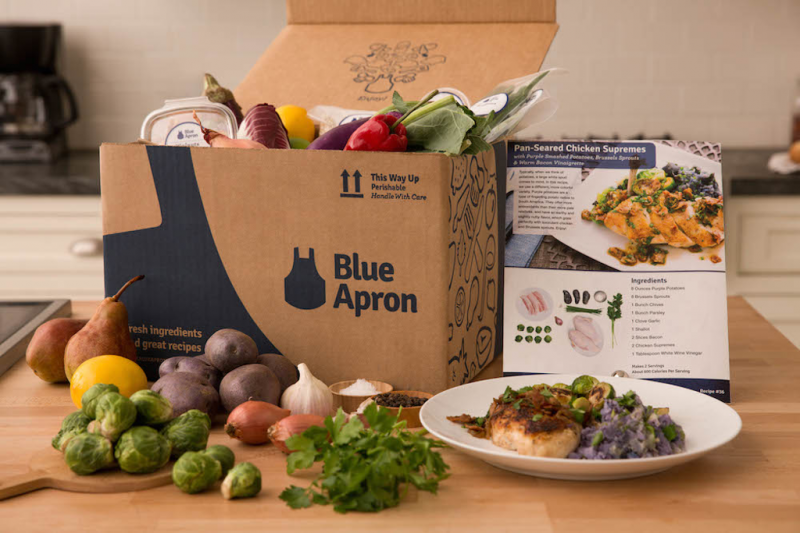 Along with the regular Blue Apron meal kit delivery service, this company also offer a similar service called Blue Apron Wine, and a online store called Blue Apron Market which sells prep tools, cookware, and cookbooks. The first thing you need to do is create a free account at BlueApron.com. Once you enter your email address and zip code you then pick from the 2-Person Plan or Family Plan. After you have chosen a plan you then select your dietary preferences. This includes if you are a vegetarian or not, and what type of protein you don't eat. This includes Beef, Poultry, Fish, Lamb, Pork, and Shellfish. You then select your delivery preferences which includes your address type (residential or business), and your delivery day. The final screen before your payment information is your full name and address along with a phone number. You may also enter special delivery instructions here. These special instructions allows you to specify leaving your package with a neighbour, or at the back door, etc. You just need to be as clear as possible. Every week Blue Apron creates 6 menus to suit a variety of dietary preferences. This includes vegetarian, pescetarian (eats fish and not meat), and people who love meat and fish. Based on your preferences Blue Apron will select which of their menus best fit what you eat. You can change your dietary preferences at any time from your account settings on the Blue Apron website. Every week on your selected delivery day Blue Apron will ship to you all the ingredients you need in the proportions the recipe requires along with a color recipe card which has step-by-step instructions. The only things Blue Apron assume you have in your kitchen is salt, pepper and olive oil. Each meal takes about 30 minutes to prepare and cook and is designed to be well-balanced and healthy. The recipe cards include the calorie count for the meal listed under the ingredients. Blue Apron has an app available for the iPhone. With the app you can look up recipes, watch how-to videos, and find information on the ingredients Blue Apron sends you. Their entire recipe collection is available from the app where when you are finished cooking a particular recipe you can upload photo's of your master piece and share it with friends. Subscribers of Blue Apron can also manager their accounts and customize their menu's for upcoming weeks via the Blue Apron iPhone app. Blue Apron offers 2 plan types, the "2-Person Plan" and the "Family Plan". Both have free shipping and both allow you to skip weeks if needed (put your subscription on hold due to vacations, etc.). Subscriptions also can be cancelled anytime. All you need to do is visit your account page on Blue Apron to manage all aspects of your subscription. Cancellations and skipping of weeks must be done 6 days before your next meals delivery. This family oriented plan is for 4 people and gives you the option of having 2 or 4 recipes and pre-portioned ingredients sent each week. These recipes are kid friendly and are designed to be served family style. 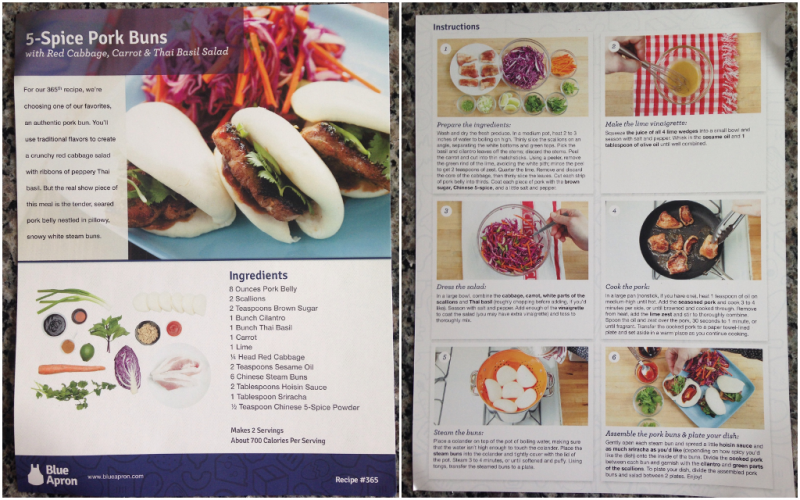 Every week Blue Apron creates 4 new family plan recipes. If you choose the 2 recipes a week option then your menu will be customized based on your dietary preferences. If you selected 4 meals then you will receive all recipes for that week in 2 deliveries. The deliveries can either come together or you can space them out depending on what is best for your schedule. * Prices based on a weekly subscription. Prices can increase/decrease depending on subscription length. All prices in USD unless specified other wise. Costs and features offered last checked July 04, 2016. Blue Apron delivers their meal kits for free and nationwide to the contiguous United States from Tuesday to Friday. Select location do have the option of deliveries on any day except Sunday. Your food is delivered in refrigerated boxes that have insulated liners and ice packs to ensure your ingredients stay fresh the entire day, this way you don't have to be home when the meal kits are delivered. Each week when your delivery ships, Blue Apron will send you an email with the shipping information along with a link so you can track your delivery. In certain areas, you can also provide additional delivery instructions to Blue Apron for your package. For example you can have it left with a neighbour or a doorman. A monthly wine delivery service which pairs nicely with Blue Apron dinners. Receive six premium wines every month for $10 a bottle. Includes red and white wines (usually 3 of each) in 500ml bottles which is ideal for two people to share. Included with each bottle is a printed card which tells you about the wine, who made it and where. It also explains what type of meals pair ideally with the wine. This service is designed to allow people to explore different varieties of wines and wine regions. At the Market you will find for sale high quality kitchen knives and prep tools along with cookware, wine glasses and cookbooks. You can also stock your pantry with a selection of seasoning, salts, peppers, and olive oils. 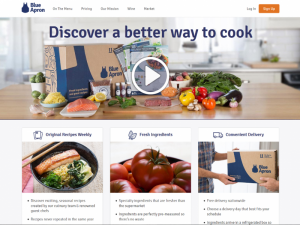 The support portal at Blue Apron includes a search-able FAQ of articles that answer questions related to meals, account management, membership and plans, shipping and delivery, wine, and the Market. You can also contact Blue Apron support via an online contact form, email and a toll free phone number from Monday to Friday, 10am to 6pm (EST). Blue Apron also offers an email newsletter will you will be kept up to date with the latest news and recipes. You can also follow Blue Apron on social media through Facebook, Twitter, Instagram, and Pinterest. I have been a member of Blue Apron for over a year. To truly test out these meal delivery services you need to use it for at least 3 weeks. Don't fall for the 1 free meal delivery as you will have to signup for the service anyways and it means if you did want to cancel you would have to do it before really trying out the service. The quality of the food is excellent. I am almost 6' and my husband is over 6' and we are both a bit over weight. With Blue Apron we always have leftovers. My daughter is now back from college but I still get the same order as before but I add a little to the recipe like some extra meat or potato, this depends on the recipe obviously. The 3 of us eat well this way and 2 people will have no problems with the 2 person meals. The only thing you need your self is salt, pepper and oil. To organize things I have bought 3 plastic bins to separate the ingredients for each meal while I unpack the main box. I get our Blue Apron delivery on Saturday which I like and one of the main reasons we choose them initially since the other meal services did not offer this. I usually cook the Blue Apron meals on Sunday, Monday, and Tuesday so I can use up all the fresh ingredients. People have complained about the packaging, and there is a lot. You can signup for free recycling but I have yet to do this. I used a Groupon and signed up when Blue Apron had a $30 deal. The meals I received where awesome but the shipping by FedEx is a bit of a pain. FedEx only comes around my neighborhood at a specific time which means I would have to rush home from work to be on time to get the delivery. In a few cases I was minutes from missing the delivery which is not good as I don't want the box sitting ins some warehouse over night just because I wasn't home for the delivery. Other than that the food has been fresh and I always have gotten the ingredients I needed for the meals (I have read other reviews of some people missing ingredients). I really enjoy most of the recipes but would like to see a few more options every week to add a bit of variety. I find these meal kit services a little expensive. I don't mind paying for the meals as they are good but it is only me and my husband. If I had kids I would think twice about spending so much. I really like what Blue Apron has to offer. Fresh ingredients and easy to follow and understand recipes with photos on nice cards that can be reused. We have a full binder of them now. It's fun to review and select from the 6 options every week for delivery. Our delivery has never been late or damage and the ingredients have always been cold and fresh. My husband and I are in our late 60's and retired so are always home for the delivery. I have seen some complaints online on delivery for other meal kit services but we have not had any issues with Blue Apron, but us being always home might be part of the reason for this. I have always enjoyed cooking from scratch and my husband of almost 50 years look forward to these meals as a treat as they are recipes and food combinations we would not normally try. We have been using it for over 9 months now and plan to continue. Different meals every week. Makes cooking fun. I first tried Blue Apron last month with a Groupon I purchased for 3 x 2-person meals. I am on week 4 and I am always excited to get our next delivery and have enjoyed the meals I have cooked from their recipes and ingredients. I do have a few small issues though. I bought the Groupon for the week of meals and I didn't realize that I would need to signup for a subscription at Blue Apron before I could get the meals. Customer service told me I could cancel as long as I did it before being billed for the next weeks meals. So I thought that was okay but still it required an extra step for me. I understand their logic behind it to retain customers but if you are trying to get people to try the service it would be good if they allowed you just to order one week's worth of meals with out the subscription. I almost didn't try it for this very reason. The packaging Blue Apron works well and keeps the meals cool even if left out for a number of hours which happened to me when I was away. I wish the packaging wasn't as wasteful in terms of the cold packs, insulation, plastic bottles, and plastic wrap but everything for the most part is recyclable. Where Blue Apron really stands out though is the recipes and ingredients. The meats and vegetables sent are of high quality and fresh and the recipes are very tasty. I was getting bored with my own cooking as I found it difficult to find recipes I like. In the 4 weeks I have been using Blue Apron I haven't had a meal yet that I didn't really enjoy. Last week was my first week that I used Blue Apron. I got the 2 person plan which gives me 3 recipes a week and all I can say is that I am now hooked!!! I have always loved cooking and with Blue Apron they have removed the most stressful part for me... deciding what to cook and getting the ingredients. I don't have to shop for groceries, I don't forget ingredients, and the directions on the recipe cards make sense and are easy to follow. There is a bit of work preparing the meals but I find that part of cooking fun after a stressful day at work. I can't wait to see what we get this week, my delivery is tomorrow.